"One Size Does Not Fit All"™. Getting fit for custom clubs is a very popular trend in the golf industry today. The Profile SGI complete golf set is the only "Custom fit in a box" system in the world. It features options with various lengths, lofts, flexes, bags and grip sizes to more perfectly fit beginner golfers and their unique physical characteristics. Forged Titanium composite 460cc oversized Driver with power weighting technology. Large sweet spot face Driver with stronger loft for greater distance. Durable and lightweight self activating stand bag with ample storage pockets. Padded seven-way with convenient lifting handle protects graphite shafts for sustained performance. 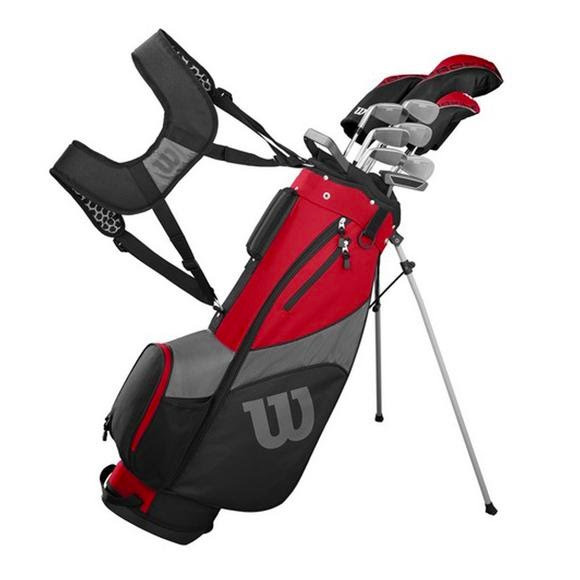 Ergonomic double shoulder straps increase on-course comfort and lessens fatigue. Comfortable mesh strap over padded hexagon core promotes air flow for cool comfort.